Over the years we have helped thousands of golfers improve their games. The GGA “Path” is the GGA formula for success– the most effective way that we can help you become a better golfer. By identifying where you are on the path, we can help you improve more rapidly and have more fun. 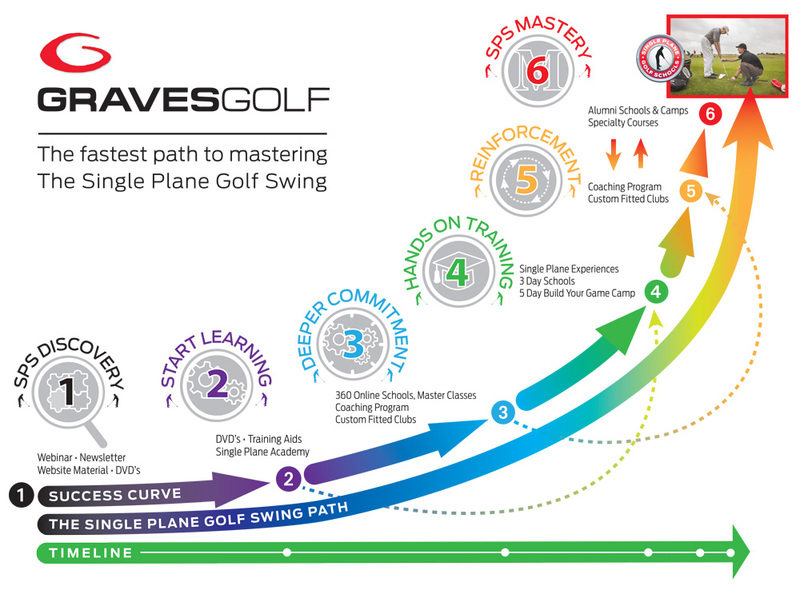 The Path is the greatest experience GGA can provide for you – the aspiring Single Plane Golfer. Why Does The Path Offer the Greatest Chance of Success? No matter where you are with your golf game, the “Path” IS the shortcut to your improvement. Based on years and years of experience studying tens of thousands of students, we have identified exactly how students improve. All of them have followed the GGA Path. Think of the Path as though you were building a house. What would you do first? Most people say, “Build the foundation.” But the most important thing is the “Plan,” the “Design,” the “Blueprint.” The GGA Path is the Plan. Once you have the plan in place you can take the next steps – build the foundation and move yourself along your personal Path. Why Does The Path Matter? The Path comprises the exact steps you need to follow to build a fundamentally solid Single Plane golf game. The Path matters because we know what it takes to have success. We have built the plan. All you have to do is follow the GGA Plan – stay on The Path. Contact a GGA Coach. The best way to start is to determine exactly where you are and where you need to be on the path. The GGA Coaches can help you assess where you are now and help you get to the next level. What is the most important part of the path? Each part of the path is a unique building block of understanding, training and coaching. The most important part of the path is knowing where you are and how to move to the next level. The GGA coaches will help you determine where you are. For example, are you fully familiar with the Single Plane Swing, and the Moe Norman Model? This would place you at step 1. Are you practicing correctly with feedback tools? Are you using the material provided in the DVD Training when you practice and have you identified your weaknesses? This would place you at step 2. Have you worked through a 360 Home Study / Online School? Do you understand the TOTAL GGA System of how the long game relates to the short game? This would put you at step 3. The GGA Path is like building a house, starting with the Planning and Understanding Stage – the building of a foundation of understanding. Constructing the foundation is next. Then, as you progress, you begin to construct framing and walls, add wiring for electricity, plumbing for sanitation and water supply, and other required systems. As you add exterior details, your house takes shape. Along the way, you have your work inspected (inspectors / “coaches”) to make sure you are building everything correctly according to code. Then once everything is built, you fine-tune the details of the paint and trim with the feedback of proper coaching. Lets look at each step to help you identify where you are in building your Single Plane Golf Swing. At this step, your curiosity, frustration (and maybe pain) has led you to look at the Single Plane Swing as an answer to your problem. You haven’t fully committed at this stage, but you wonder if the Single Plane Swing might be the answer to your golf game’s health. At Step 2, you have purchased and studied the Single Plane Solution (SPS) video. You have an understanding of the basics for the Single Plane Swing and the short game. You might not be able to swing like Moe yet, but you understand the basics of the Moe Norman model. At this stage you start to teach yourself the Moe Norman swing by watching the videos. As you attempt to learn the swing, we suggest that you dive deep into the training with the proper drills and practice techniques. The Graves Golf Academy has specific training DVDs and training products that help you understand the model and practice the ideal way. The GGA training aids help you ensure that you are practicing correctly by giving you feedback in every practice session. Step 2 is all about self-practice and making sure you are practicing correctly. This is where you start building the foundation of the house. Step 3 takes in what we call the “breakthrough” zone. This is where students apply the fundamentals they have learned and their practice starts to pay off. This deeper commitment means a deeper understanding as you move into the next stage of building your game. The GGA online school programs include the 360 Home Study School and the Master Class. This even includes working with a Coach in the Video Coaching program. At this stage you are building the walls and putting on the roof and the structure is taking shape. Step 4 is all about attending a GGA School and working with the Coaches. At this stage GGA Coaches can show you “in person” the exact things that you need to do improve. This is where what you have been feeling as you practice on your own meets reality. This is where we can personally customize and tailor the program for your improvement. Progress accelerates in at this stage. This is where you install the wiring and plumbing and drains and put up the exterior walls of the house. Everything starts to come together. At stage 5 you have everything you need to know to build a great golf game. Now you need coaching and custom-fitted clubs to practice correctly and put in the dedicated time to improve. This is where the GGA Coaches can help you stay on track and stay accountable. GGA also recommends that at Step 5, if you haven’t done so already, that you take a serious look at your golf equipment to ensure that you are getting the most out of your game. At this stage you are painting your house, getting it inspected and making sure all of the plumbing, electrical and fixtures are up to code. At stage 6, you are on your way to SPS mastery by attending Alumni Schools, Camps and Specialty Courses. Your house is built. Now you need to furnish and decorate. But this doesn’t mean the work is done. Anyone who owns a house knows that you can always adjust and improve and make sure that everything is working correctly. This is where the GGA alumni and coaching programs can keep you comfortable with your new game (in your new home). How do I measure my progress on the path? Once again, think of your golf game as you would if you were building a house. Do you have a plan? How is your foundation, including your grip and setup? How are your short-game fundamentals? Do you know how to practice or have the tools needed to make progress? If the fundamentals are in place, do you KNOW that you are correct? Do you need help from a coach? The GGA Coaches can help you determine where you are on the Path and help you Build a Success Plan for 2019.